American Society of Agronomy – Interest in organic farming is growing. However, controlling weeds without synthetic herbicides, as organic certification requires, is challenging. Scientists are studying alternative tools for weed management. One such tool is propane-fueled flame weeding. Flame weeding sounds as if it means burning plants. But propane-fueled flame weeding systems do not set fire to plants. Instead, they control weeds by applying direct heat to plants. The heat rapidly raises the internal temperature of plant cells. The water in the cells expands and the cell walls burst. This release of water quickly dries out the plant tissue. Water loss and other heat-related changes kill or seriously damage the plant. Research conducted by Stevan Knezevic and colleagues at the University of Nebraska–Lincoln has led to a greater understanding of flame weeding. The researchers have studied flame weeding techniques with seven crops: field corn, popcorn, sweet corn, sunflower, soybean, sorghum, and winter wheat. Insights from this research have now been compiled into a training manual. 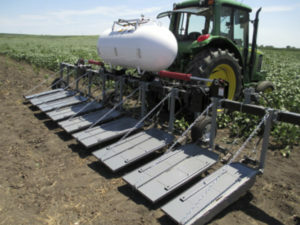 The publication describes the most effective “recipes” for propane-fueled flaming as a weed control tool for these crops. Flame weeding treatments can be non-selective or selective, Knezevic explained. “During non-selective treatments, everything in the treatment path—both weeds and crops—is fully exposed to heat,” Knezevic said. Non-selective treatments are effective for controlling seedlings of early emerging weeds. It’s best used before the crop plants emerge or when grassy-type crops (corn, sorghum) are young and still able to recover from any treatment damage. When more propane is delivered to the torches, greater heat is created. But to manage costs and conserve fuel, it makes sense to use the lowest effective dosage (measured as gallons per acre) of propane. The propane dosage needed for successful flame weeding depends on the growth stage of the weed; 10-12 gallons per acre is a general use rate. The researchers studied flame weeding with a wide variety of broadleaf weeds. These included common waterhemp, redroot pigweed, field bindweed, kochia, ivyleaf morning glory, velvetleaf, Venice mallow, common ragweed, common lambsquarters, tansy mustard, and henbit. The researchers also studied grass weeds, including green foxtail, yellow foxtail, and barnyardgrass. Knowing the stage of weed growth makes a difference. Smaller weeds of both types proved much easier to control with propane-fueled flame weeding than larger weeds, and required a lower propane dosage. Plant tissue is thin and delicate in these early growth stages. This makes the plant more sensitive to heat and prevents the weeds from recovering after heat damage. When deciding to apply flame weeding after crops emerge, the crop growth stage is also critical. All crop plants are sensitive to heat, and flaming crops at the wrong growth stage can result in severe losses, especially in soybean and sunflower. Researchers developed guidelines with recommended crop growth stages for post-emergent flame weeding. The position of the torches and flames in relation to the crop row is an important factor in these guidelines. Certain perennial and biennial weeds, such as dandelion and several thistle types, are very sensitive to heat. However, flaming does not reach under the soil to damage the roots, so the above-ground vegetation regrows and flaming must be repeated several times during the season. Knezevic presented his research at the October Annual Meeting of the American Society of Agronomy, Crop Science Society of America, and Soil Science Society of America in Tampa, FL.